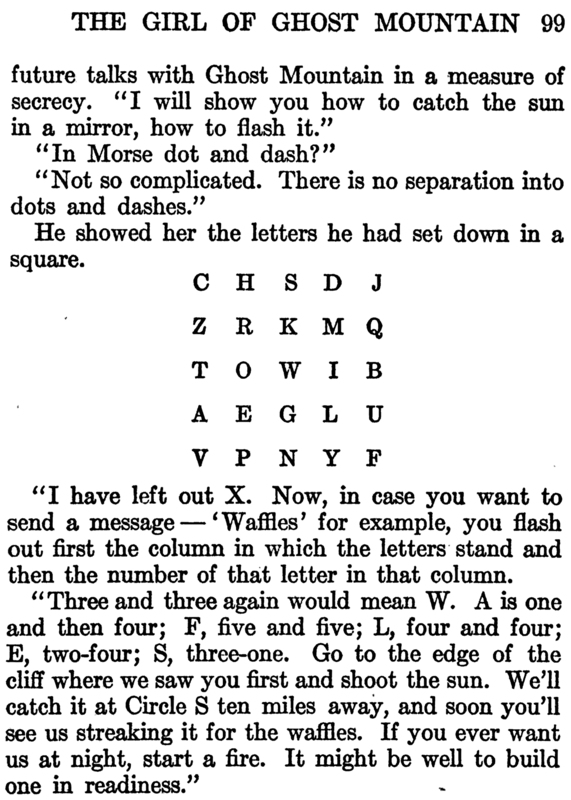 This letter grid for mirror-flashed code (from The Girl of Ghost Mountain by Joseph Allan Dunn, 1921) can serve as a Boggle puzzle. We found several five-letter words relating to: an obstinate person; a collector of dirty water; a swelling protuberance; a portable illumination; another word for "cusk"; a second growth of hay in one season; a monetary unit replaced by the forint; and a plate for consecrated bread. This puzzle grid contains several big words, including one as blue as the sky. Can you find them? Today's puzzle grid, an Emily Dickinson quotation, appears over a dear reader's bookcase. There's an 8-letter word that means unconfident. There's a 9-letter word that refers to plants with four petals. There's a 7-letter word that refers to fig trees, and another that belongs in the kitchen. This puzzle grid reads, "It is in giving that we receive." The grid contains a word for a baby growing incisors. It also contains a word referring to paying a social call. Can you find them?